This was absolutely true! Amy lost her voice, before the show started - enough said. Fiber people bring out the silly in me, I know my face hurt from smiling and my stomach from laughing. Also I love all of the hugging. 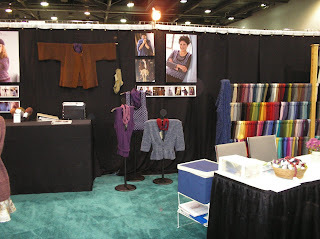 Here's the Classic Elite booth, featuring my new Curvy Knits designs - look at all of that space devoted to fat girls!!! I'll give you a tour of the designs closer to pub date. I have bunches of pictures to put up - birthdays, fiber, lots to show and tell! The booth looks fab. Too bad so many of the photos show models covering themselves with their arms. Sigh. Progress, not perfection, I guess. The designs will speak for themselves, they even look great on hangers, so you're covered. Can't wait to hear more when it's time. Yeah, TNNA was very good this year. Loved it. I so want a T-shirt with the *Zone of Fun* image on it!